If memory forms our personal identity and shared memory forms our cultural and even racial identity, what does it mean when memories are lost? Bend explores this question by examining the lives of two men interned in a Japanese American Relocation Camp during World War II: the artist’s father, an Asian art historian who is currently suffering from dementia, and the subject of his research, Isamu Noguchi, a half-Japanese-half-American sculptor. Using sand as her canvas and brooms, rakes, and blocks of wood as her brushes, the artist transforms image after image, calling to mind Noguchi’s landscape designs, as well as Zen Buddhist rock gardens. Live feed projection of these drawings is combined with archival film footage, blurring the line between dream and reality and reflecting the current confusion of the artist’s father. In the end all that is left is the audience’s memory of the performance. Bend has been made possible with support from the Tapp’s Arts Center, the Jim Henson Foundation, the South Carolina Arts Commission, the National Endowment for the Arts, the John and Susan Bennett Memorial Arts Fund of the Coastal Community Foundation of SC, Alternate ROOTS, the New England Japanese American Citizens League, the Arkansas Archaeological Survey, the Arkansas Arts Council, the Arkansas Humanities Council, the World War II Japanese American Internment Camp Museum, the Nathan Cummings Foundation, the Ford Foundation, the Andrew W. Mellon Foundation, the Kresge Foundation, and the Kō Festival of Performance. The performance at the University of Rochester has been generously supported by the Humanities Project. 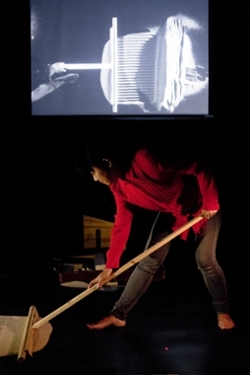 Kimi Maeda is a theatre artist whose intimate visual performances cross disciplines and push boundaries. Her ephemera trilogy is a collection of sand drawing and shadow performances that deal with memory, home, and trans-cultural identity. She received a Jim Henson Seed Grant for the development of Bend, the final part of the trilogy. In 2011 she founded Belle et Bête, a puppet production and promotion company, with artist Lyon Hill. Together they produce the bi-annual Spork in Hand Puppet Slam. They also created Planet Hopping, an intergalactic puppet adventure, as well as Grime and Glory, a multimedia puppet celebration of barbecue pitmasters. Kimi received her MFA in scenic design from the University of South Carolina, her MA in Scenography from Central Saint Martins College of Art and Design in London, and her BA in studio art from Williams College. She was the recipient of the 2005 Rose Brand Award from the United States Institute of Theatre Technology and her costume design for Polaroid Stories was chosen for display in the 2007 Prague Quadrennial. She has designed sets and costumes in Columbia, Atlanta, Philadelphia, Boston, New York, Baltimore, Norfolk, London, and Sevilla and was a puppeteer for several years for the Columbia Marionette Theatre. Bend will be performed February 16, 2016 at 5pm in the Gowen Room, Wilson Commons.